The last PPC campaign I analysed in the ‘Analyse A Real PPC Campaign’ series was from Car Parts 4 Less, who had ranked number one for paid search results, but had areas the search advert could have improved on. The landing page was also a little outdated, signifying the important of the weather seasoning to businesses running PPC campaigns. Continuing the discussion of seasons, we are heading into Spring, bringing with it a different fashion than winter. With this, here is an analysis of a PPC campaign from Thread. Thread is the only search advert appearing for this search phrase, potentially because of the sponsored shopping results putting other competitors off. Since sponsored shopping results have both prices and an image to accompany the result, it makes it harder for PPC search adverts to get the exposure they need. Thread have chosen to not use prices in their advert, which helps them not compete directly to sponsored shopping results. The title of the advert starts with a subtle call to action, which will help to entice the web user into thinking what can they gain for free from Thread. The site link extension is used at the bottom, presumably for the most popular type of men’s clothing. In general, the most links the web user can click on, the higher the click through rate. The only problem is that, unless all of the links have the same common conversion goal, the conversion rate might suffer. As a landing page goes, this is not very good. The design is good, and it is smooth and slick in its motions when the web user adds information in the form of a lead capture. The problem lies with what Thread are trying to obtain, in terms of information, from the web user. 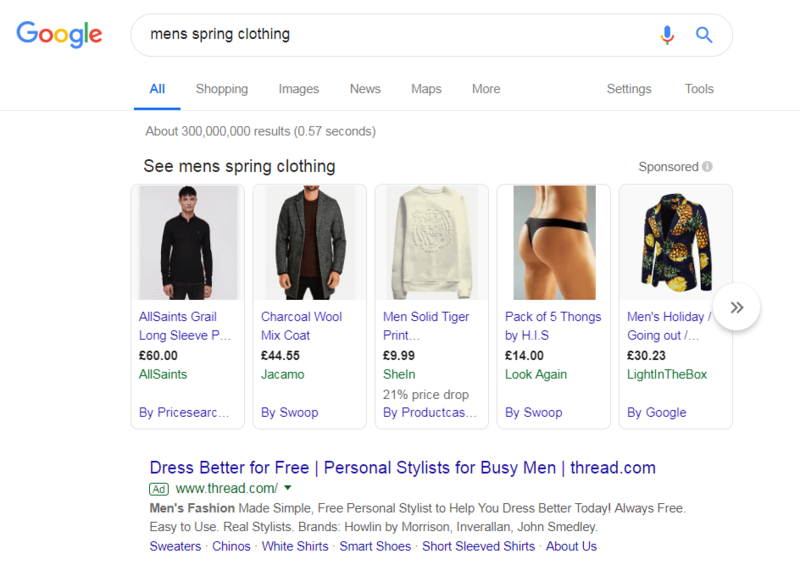 It should be made clear from the search advert and search phrase that Thread were aiming this search advert at men, or those looking to buy men’s clothing. 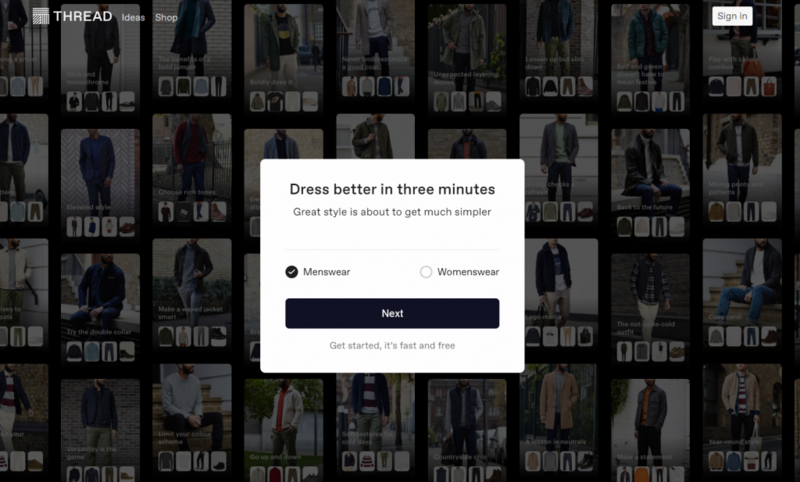 The fact that the first and main lead capture on Thread’s landing page is referring to a choice between men’s and women’s clothing is aninefficient waste of time for the web user. Everything before the landing page suggests we already know the audience are wanting menswear (and if they are choosing womenswear, then there is something wrong with the advert or targeting method in the PPC campaign). First impressions are everything for a landing page. Making web users do unnecessary actions that have already been confirmed through their actions of clicking onto an advert interested in men’s wear will result in web users losing their patience quicker, resulting in a reduced conversion rate. Don’t Expect To Ignore A Sticking Point Away, People.